This is a continuously updated post about art therapy* prompts and activities for groups. To my knowledge, these are new ideas not otherwise published or included in manuals. These are appropriate for art groups in all sorts of contexts- from therapeutic groups to artists’ meetups and “paint and sip” style get-togethers. Adapt the prompt and your supplies to the skill level and developmental level of your participants- the nice thing about art prompts is that they are easy to scale to your audience! Fluid Acrylic is acrylic paint that has bee specially prepared to be no thicker than water while maintaining a normal level of pigment. 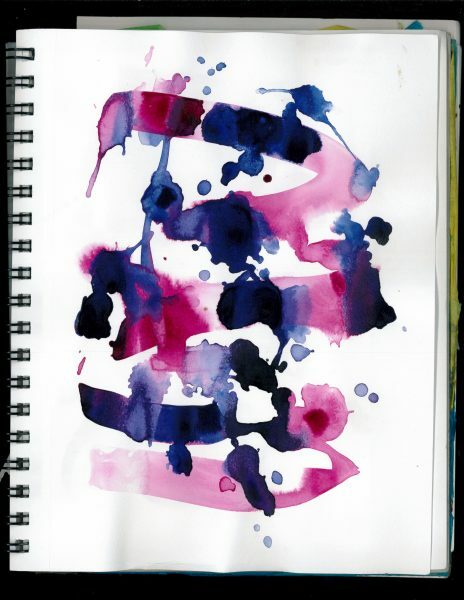 Dropping fluid acrylic onto wet paper creates chaotic designs that can help us learn how to practice letting go –using this media, it becomes quickly obvious that the more you interfere with the process of the paint, the more muddled the art becomes. The effects of the fluid acrylic as it spreads across the page merging or sometimes chasing other colors is mesmerizing. Be sure to provide enough paper for multiple paintings for each person. Plan to leave the paintings overnight to dry- fluid acrylic will remain wet and “drippy” for many hours after painting. glue syringes are great for limiting spills. What moves in orbit within the galaxies you inhabit? 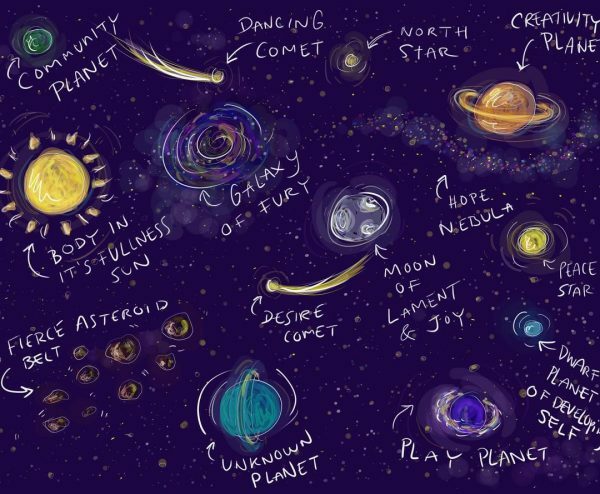 What are the significant constellations of your solar system? White Acrylic Paint, Old Toothbrushes, and a well-protected space to splatter stars. Where have you edited yourself this week? What has had to be removed/edited/concealed before bringing yourself into this world? Who gets to edit? All of us have been handed a story by our culture, family, and education. Self-discovery is often a process of finding out where this story actually has overwritten elements of our identity or narrative. 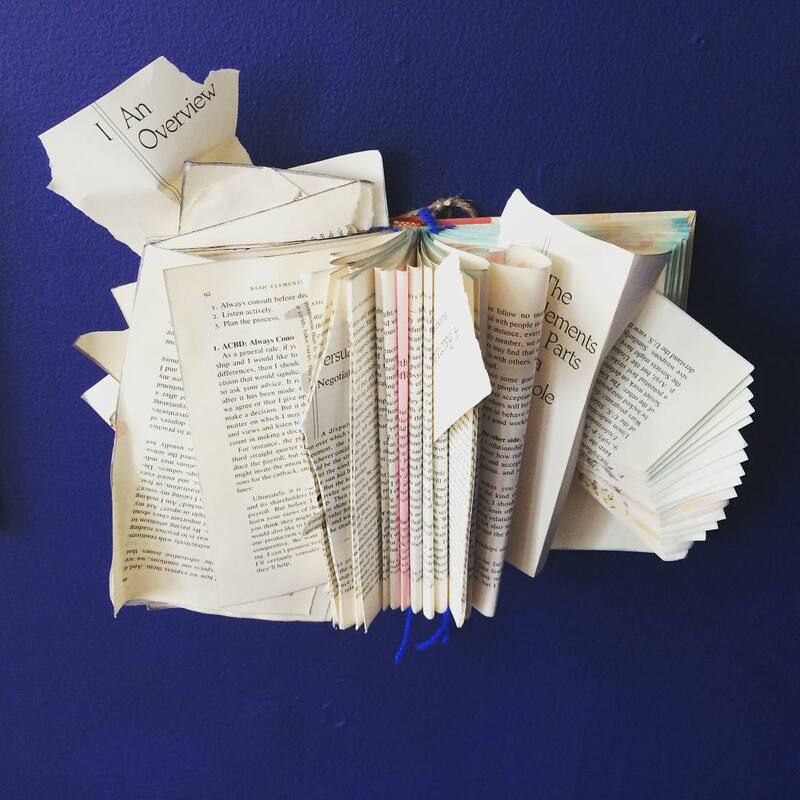 In this prompt, participants each choose a discarded library book and are encouraged to consider the power they have to change how a narrative is engaged. Participants may edit the content (via black out poetry) or the pages themselves. 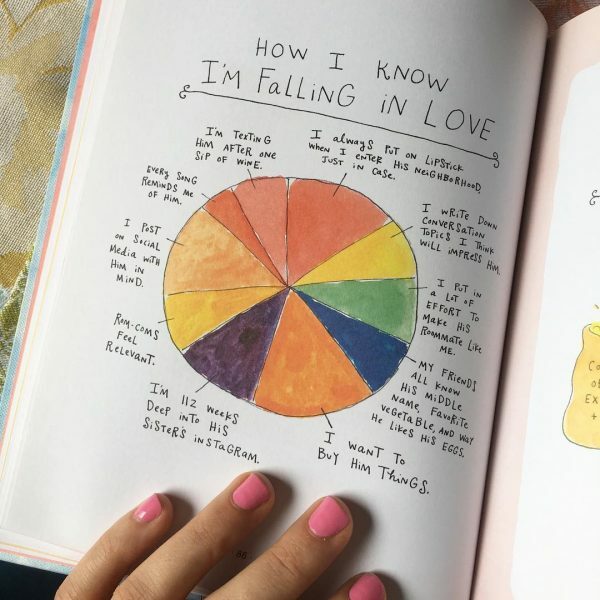 This can feel like a BIG question, to structure the prompt for participants I start the meeting by showing the examples of artist Mari Andrew’s work, who breaks questions like this down into pie charts, graphs, mind maps, or illustrated figures with well-labeled parts. Kintsugi (or Kintsukuroi, which means “golden repair”) is the Japanese art of fixing broken pottery with precious metals, creating reconstructed pieces with seams of gold. In our group, each participant picked a thrifted piece of pottery, went outside and broke it into pieces, and then repaired their piece with gold. This creation by a group member (permission given to share) shows how creative reconstruction joined two broken pieces creatively. The gold glue is made by combining Quick Set Epoxy with Gold Mica Powder. The Quick Set Epoxy really is quick- which is great for rebuilding but be sure to mix very small batches (no more than 1 Tablespoon at a time) or you’ll find- as we did- your glue setting on your mixing surface before it can be transferred to the broken pottery. 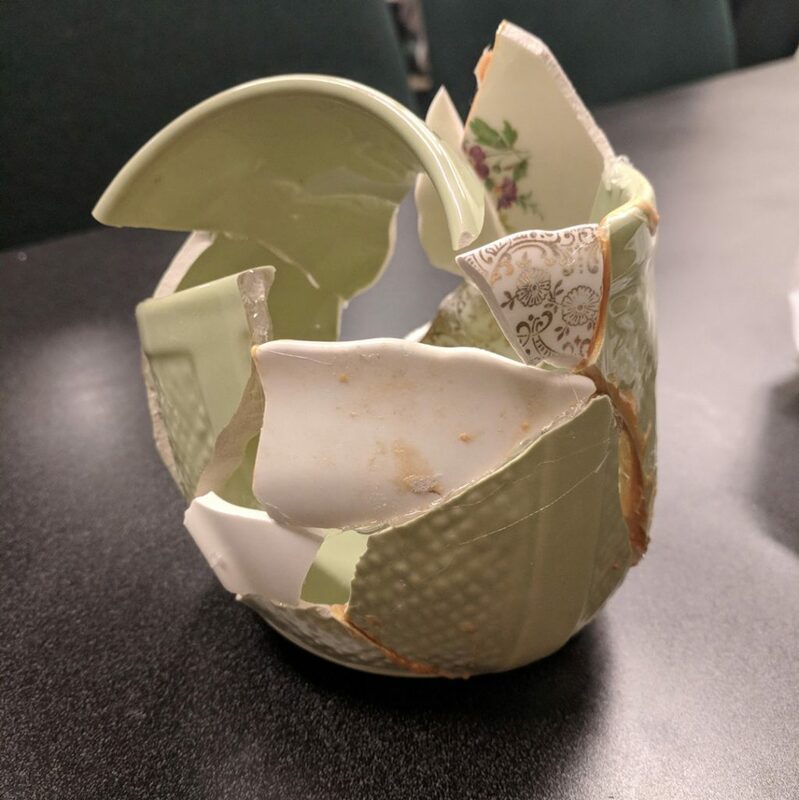 It was fun to see how individuals translated this prompt- some participants rebuilt their pot, others used pieces from other pottery to repair where theirs was too broken, and one person even built a lotus flower from her piece which had been broken beyond repair. 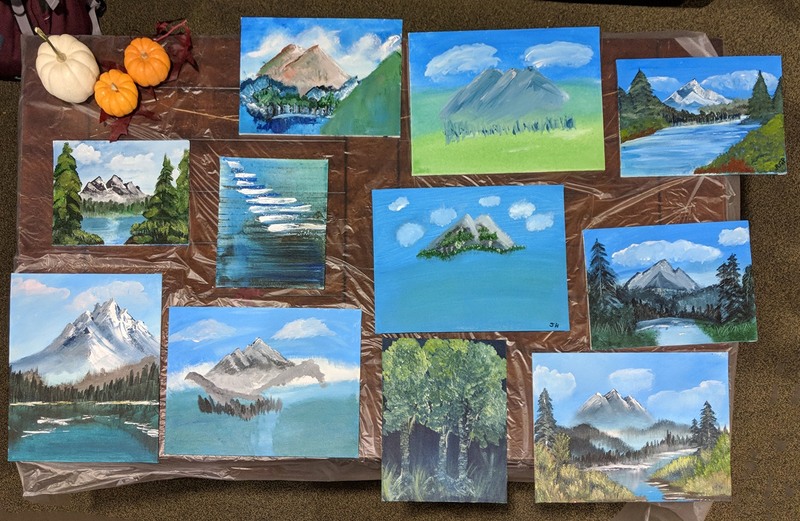 For the last Art Group meeting of the year, we decided to host a Paint Along with Bob Ross night. This prompt was intended to be more playful than expressive- as well as a low-barrier invitation to our art group for people who struggle with the fear of a blank page/canvas. We simply found a full-length Bob Ross video online (Netflix has dozens! 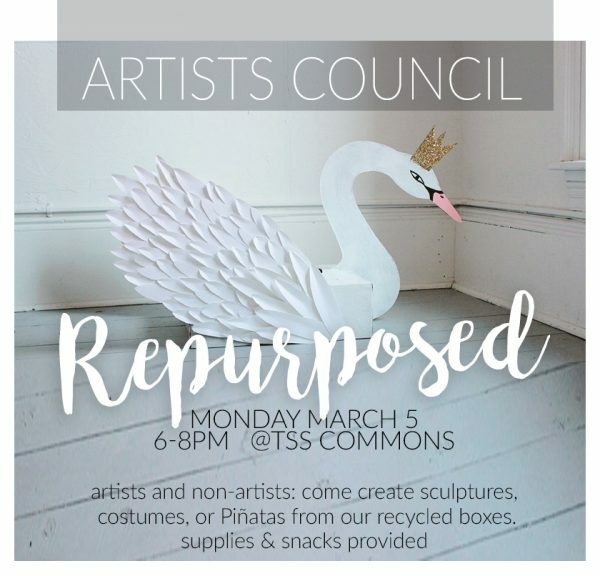 ), screenshotted the list of required supplies that displays in the first few seconds of a show, and purchased small, prepped canvases and supplies. I was intentional, as the leader, to invite participants to follow along or not follow along, and to either paint the scene, paint the scene the way they envisioned the scene, or to not paint the scene at all. 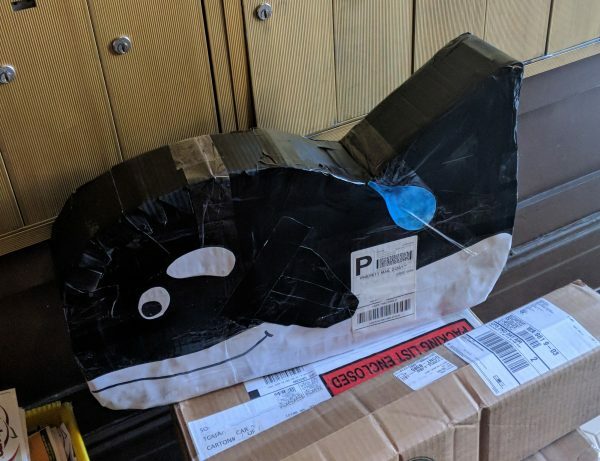 Remember when you were a kid and all you needed was an oversized box to imagine you were flying into space or lounging behind a mansion? This prompt invites us to consider what beauty we can imagine from what is discarded.